Grand Sumo: http://www.sumo.or.jp/En/ Sumo (相撲 sumō) or sumo wrestling is a competitive full-contact wrestling sport where a rikishi (wrestler) attempts to force another wrestler out of a circular ring (dohyō) or into touching the ground with anything other than the soles of his feet. The characters 相撲 literally mean "striking one another". The sport originated in Japan, the only country where it is practiced professionally. It is generally considered a gendai budō (a modern Japanese martial art), but this definition is misleading, as the sport has a history spanning many centuries. Many ancient traditions have been preserved in sumo, and even today the sport includes many ritual elements, such as the use of salt purification, from Shinto. Life as a wrestler is highly regimented, with rules regulated by the Japan Sumo Association. Most sumo wrestlers are required to live in communal sumo training stables, known in Japanese as heya, where all aspects of their daily lives—from meals to their manner of dress—are dictated by strict tradition. From 2008 to 2017, a number of high-profile controversies and scandals have rocked the sumo world, with an associated effect on its reputation and ticket sales. These have also affected the sport's ability to attract new recruits. Despite this setback, sumo's popularity and general attendance has rebounded due to having multiple yokozuna (or grand champions) for the first time in a number of years and other high-profile wrestlers such as Endō and Ichinojō grabbing the public's attention. In addition to its use as a trial of strength in combat, sumo has also been associated with Shinto ritual, and even certain shrines carry out forms of ritual dance where a human is said to wrestle with a kami (a Shinto divine spirit). It was an important ritual at the imperial court, where representatives of each province were ordered to attend the contest at the court and fight. The contestants were required to pay for their travels themselves. The contest was known as sumai no sechie, or "sumai party". Professional sumo (ōzumō) roots trace back to the Edo period in Japan as a form of sporting entertainment. The original wrestlers were probably samurai, often rōnin, who needed to find an alternative form of income. The winner of a sumo bout is generally either: The first wrestler to force his opponent to step out of the ring The first wrestler to force his opponent to touch the ground with any part of his body other than the bottom of his feet. Matches consist solely of a single round and often last only a few seconds, as usually one wrestler is quickly ousted from the circle or thrown to the ground. However, they can occasionally last for several minutes. Each match is preceded by an elaborate ceremonial ritual. Traditionally, sumo wrestlers are renowned for their great girth and body mass, which is often a winning factor in sumo. 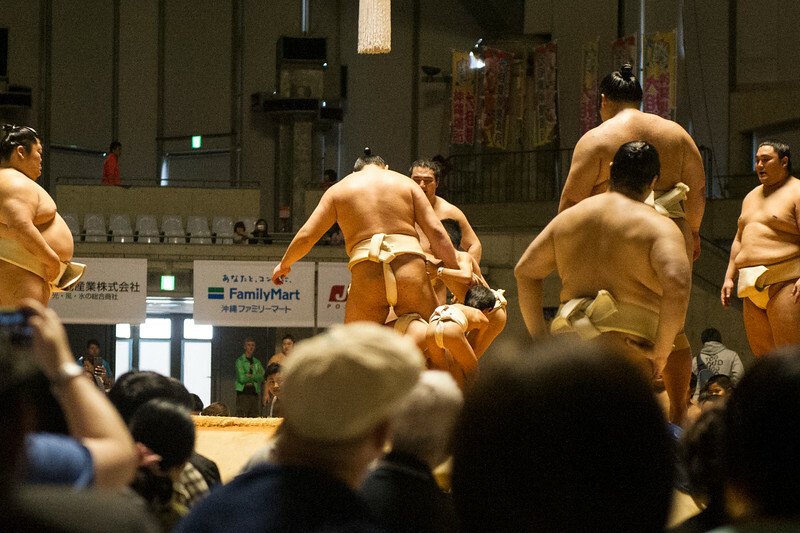 No weight divisions are used in professional sumo, and considering the range of body weights in sumo, an individual wrestler can sometimes face an opponent twice his own weight. However, with superior technique, smaller wrestlers can control and defeat much larger opponents.